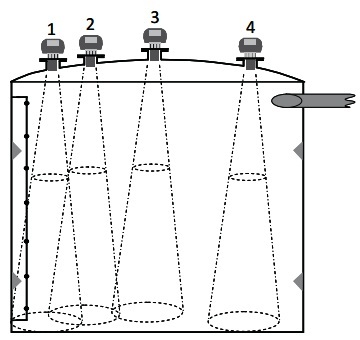 Pop Quiz: When you’re mounting an ultrasonic level transducer at the top of a tank, what’s the best location? Here’s a hint: It’s not #3. I admit: That didn’t make sense to me. Why not place the ultrasonic sensor in the center of domed tank roof? Position 3, though it looks ideal, is not the best location. Because the reflected echo gets focused by the parabolic shape of a domed top, especially at high material levels, secondary echoes become problematic. Really? Who’d a thought? Clearly, not me. Why is this important? Those who deal with ultrasonic and radar non-contact level sensors will agree that reliable and consistent performance depends, in large part, on installation. What they say about real estate and opening a new restaurant is true here too: It’s all about Location, location, location! Where the sensor is placed influences the measurement results dramatically. We all know how the workplace and human nature work — the guy who installs the unit is not involved in any vendor discussions about installation practice before he gets the work order to install one. Toss in our natural inclination to do what appears to be the easiest way and it’s no surprise that installation issues affect a large number of ultrasonic level measurement sites. Wanna know the best location to mount the transducer? You’ll have to read it in Siemens 4-page installation guide. See page 3 for your answer. The information has always been included in the 180-page manual that comes on CD with your Siemens level product, (but we all know how often people read that fine manual, right?). So, check out the 4-page guide instead. If you’re buying, installing or maintaining ultrasonic level transmitters, refer to the guide, and be sure to check out the quick-start guide that comes with your ultrasonic transducers. This entry was posted on January 27, 2012, 11:57 am and is filed under Echomax transducers, Installation, Level, Level Technology, Measurement, Siemens, Troubleshooting, Ultrasonic. You can follow any responses to this entry through RSS 2.0. You can leave a response, or trackback from your own site. I learn a lot from reading your blogs. Thanks!